How to get the cool Converse look – with more support and comfort for your feet. “Chuck Taylor All Stars” were invented in 1917 and have been the cool shoe that has been offering horrible support for almost one hundred years. Now, I’m not saying that the Converse Platform is perfect BUT it is a great alternative for patients (hello Pediatrics and Hipsters) who want the Converse look but have biomechanically challenged feet. I can’t tell you how sad it makes me when I have to tell a kid that their beloved Converse All Stars are not good for their feet and they should not be wearing them. I won’t lie to you – I’ve seen grown men cry over this. I’m glad my practice is on the ground floor because, otherwise, I’d spend a good portion of my day talking patients off the ledge. I can usually coax the pediatric patients into the concept of giving up their Converse when I tell them about some of the other cool shoes they can wear, like Nike Shox (the ones with the rigid sole) and the Brooks ‘Beast’. The boys love it when I prescribe the ‘Brooks Beast’, which taps into some primal guy thing that makes their eyes light up at the thought of wearing something with the name ‘beast’ on their feet. Another running shoe that is great for the Pediatric patients is the New Balance 1540 (not as cool, but they are excellent). On a personal note, my husband still has not noticed that I ‘retired’ all his Converse All Stars from our closet (cue evil laugh) and I have been slowly, insidiously replacing all his crap-Converse shoes with supportive shoes that feel great but are cool enough for the advertising world that he works in, which, by the way, is much cooler than my Podiatry world of biomechanical control and good arch support. Going to a party filled with Advertising people versus a party filled with Podiatrists – a jarring experience – much like landing on two different planets with alternate realities – but in a good way. Needless to say, the Platform Converse is a great alternative to the traditional Converse All Star with it’s thin, flexible sole that offers no support and can increase the likeliood of painful fractures, sprains, bunions, hammertoes and a multitude of other injuries. Because the platform Converse has a thick and more rigid sole, it is far more protective of the foot joints, muscles and tendons, which makes it more comfortable and decrease the chance of injury. It also meets the criteria of having forefoot, midfoot and rearfoot control that is crucial in what makes a shoe more comfortable. I would highly recommend that if you choose to wear this shoe that you wear a custom-molded dress orthotic. A functional orthotic will not fit in this shoe, but a dress orthotic should work nicely. Talk to your Podiatrist about getting custom-molded orthotics. Many people do not realize that their insurance pays for orthotics, which are often covered because insurance companies understand that proper arch support can prevent many foot, knee, hip and lower back issues as well as prevent foot deformities such as bunions. 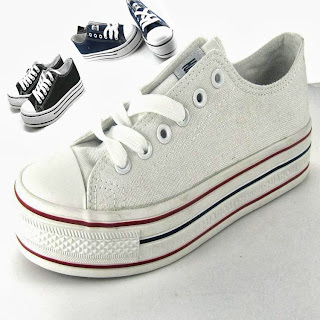 **The Plateform Converse is a fashion statement shoe – I am not recommending this for any type of sports. Chronic Pain and Your Feet: Article to soon appear in "Arizona Pain Monthly." Pediatric Foot Problems – A One Hour Interview of Dr. McCarthy about Pediatric Foot Care.